AMC Entertainment Holdings Inc. (AMC) has been mauled by the bear during the fourth quarter stock market rout along with the broader indices. Despite a record-breaking year at the box office for 2018, AMC saw its stock plummet from ~$20 to ~$12 per share or shedding 40% of its market value. The stock currently sits at ~$13.50 or still over 30% off its 52-week high representing a compelling buy in the backdrop of a record-setting year at the box office, robust slate of movies for 2019, rapidly growing loyalty program with over 600,000 members, a strong consumer, dividend yield of over 5% and accelerating revenue and EPS growth. AMC is reengaging the consumer via digital, mobile and loyalty program options, reformatting theaters to enhance the user experience and international expansion augmented by a healthy share buyback program. Furthermore, AMC has established relationships with Facebook (FB) and Groupon (GRPN) to drive ticket sales to AMC theaters. The stock looks very attractive considering its depressed valuation, industry strength forecasted through 2019 coupled with a slew of company initiatives to drive the consumer experience. The long term growth narrative remains intact while revenue continues to grow at a healthy clip. AMC has been establishing firm footing of improving fundamentals across the entire enterprise which were highlighted during its latest earnings announcement for Q3 2018. For the first none months ending September 30th, total revenues increased 10.5% to $4,047.5 million. Admissions revenues grew 8.2% to $2,522.7 million while attendance increased globally by 4.1% and increased by 6.4% in the U.S. Food and beverage revenues increased 9.1% to $1,236.4 million and other revenues increased 46.5% to $288.4 million. AMC is poised to post company records for the full year 2018 in all revenue categories: admissions, food and beverage and other. AMC’s capital return plan is very shareholder friendly, currently paying a dividend of $0.20 per share on a quarterly basis translating into a ~5.5% yield and paid a special dividend of $1.55 per share in September. In addition to its dividend, AMC has an active share repurchase program which is in the midst of a $100 million authorization and has repurchased approximately 56% of this authorization. AMC has purchased 3.7 million shares for approximately $55.7 million or an average share price of $15.07, representing a good use of capital before the market wide sell-off. On September 14, 2018, using a portion of the proceeds from the $600 million 2.95% Senior Unsecured Convertible Notes due 2024, AMC repurchased and canceled 24,057,143 Class B Common stock held by Wanda, at the cost of $421.0 million. In the past 12 months, AMC has repurchased a total of 26.7 million shares of Class A Common and Class B Common stock. Major theatrical releases broke U.S. box office revenue records in 2018. 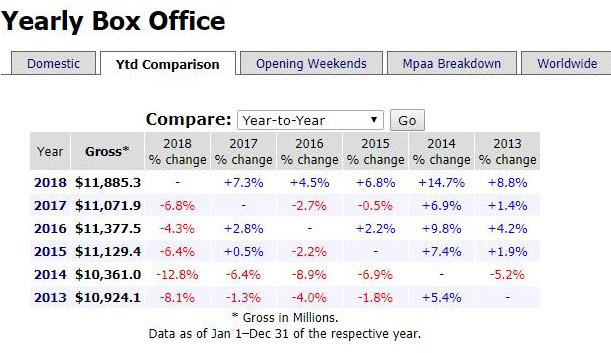 Per Box Office Mojo, 2018 box office revenue came in at $11.885 billion outpacing 2017 by 7.4% and the 2016 record year by 4.5% (Figure 1). 2018 posted the second largest first quarter and record second quarter at the box office. U.S. box office revenues hit a record $3.3 billion in the second quarter due in large part to Disney’s (DIS) “Avenger’s: Infinity War” and “Incredibles 2” with domestic grosses of $679 and $603 million, respectively. It’s noteworthy to point out that April and June were record months at the box office and revenue from April to June was up ~23% compared to the same period in 2017 ending the second quarter on a strong foot. Overall, June brought in a record $1.269 billion in domestic box office receipts besting the previous record set in 2013 at $1.246 billion. The summer box office came in 14.6% higher than 2017’s summer numbers and logged $4.38 billion in box office receipts giving way to the fifth largest summer movie season of all-time. October set another record in 2018, topping $800 million for the first time ever, outperforming 2017’s October by 47%. The fourth quarter of 2018 didn’t include a Star Wars film for the first time in over three years. Thus 2018 was absent of this strong anchor however the year ended in record fashion. Black Panther became the third highest grossing movie of all-time domestically with $700 million and ultimately grossing $1.35 billion worldwide and becoming the ninth highest grossing movie of all-time. Avengers: Infinity War posted the biggest domestic and international box office weekend of all-time with $258 and $630, respectively. Avengers: Infinity War became the fastest movie to gross over $1 billion worldwide and only the fourth movie to ever break through the $2 billion threshold ultimately grossing $678.8 million and $2.049 billion worldwide. The recent release of The Incredibles 2 shattered box office records bringing in $180.7 million during its opening weekend debut, not only shattering the previous opening weekend record for an animated film, but finishing with one of the top ten openings of all-time for a film of any genre and surpassing $608.6 million domestically and $1.243 billion worldwide. Disney had the top three grossing movies domestically with Black Panther and Avengers: Infinity War and Incredibles 2 by a wide margin from the fourth highest grossing movie. Wreck It Ralph 2 brought in the second-highest Thanksgiving five-day gross of all-time with 84.5 million ultimately grossing $181.3 domestically and $355.5 worldwide. Mary Poppins Returns already eclipsed $205 million in worldwide box office sales to cap off 2018. 2019 has highly anticipated releases that stand to rack in billions in box office receipts such as Captain Marvel (the first female lead for a Marvel film), Dumbo, Avengers 4, Aladdin, Toy Story 4, Lion King, Frozen 2 and Star Wars Episode 9. Disney is poised to defend its box office dominance again in 2019 for the fourth consecutive year (Figure 2). AMC Entertainment Holdings Inc. (AMC) is sitting on a host of positive tailwinds with record-setting box office numbers in 2018, reengaging the consumer via digital, mobile and loyalty program options, reformatting theaters to enhance the user experience and international expansion. The stock is roughly 30% off its 52-week high representing a compelling buy in the backdrop of a robust slate of movies for 2019, rapidly growing loyalty program with over 600,000 members, a strong consumer, dividend yield of over 5% and accelerating revenue and EPS growth. AMC has recently established relationships with Facebook and Groupon to drive ticket sales to AMC theaters on the digital front as well. The stock looks very attractive considering its depressed valuation, industry strength forecasted through 2019 coupled with a slew of company initiatives to drive the consumer experience. Check out my previous article on AMC. Disclosure: The author does not hold shares of AMC however may engage in options trading with the underlying security. The author has no business relationship with any companies mentioned in this article. He is not a professional financial advisor or tax professional. This article reflects his own opinions. This article is not intended to be a recommendation to buy or sell any stock or ETF mentioned. Kiedrowski is an individual investor who analyzes investment strategies and disseminates analyses. Kiedrowski encourages all investors to conduct their own research and due diligence prior to investing. Please feel free to comment and provide feedback, the author values all responses. The author is the founder of stockoptionsdad.com a venue created to share investing ideas and strategies with an emphasis on options trading.